The question was in reference to using the Major Pentatonic Scale over a blues… and changing the scale for each chord. Managed to get that one with the looper beat running in my head. It’s a first from my collection of your lessons. Got my finger pads back and looking for another. Griff,u make learning fun,I dig it,Im almost 50 an still learning the gutiar!!!! nice good job . I have seen a minor demostration in the past and memorized it. I am wondering how I might fit that in . I think that that could be easy enough to do. Major to minor to major could spice it up a bit maybe .I will have to try it . Hi Griff, Awsome lesson, just managed to download it took a while. Awesome lesson, Griff. Who doesn’t love the Allman Brothers playing, horribly tragic though the band member’s lives were? 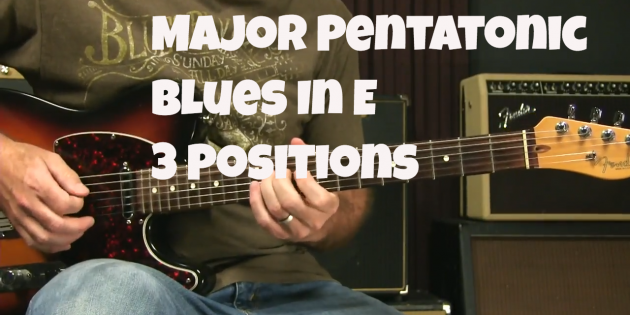 It makes learning the major pentatonic scale so it can be tastefully mixed in with the minor much clearer. I’ve always had difficulty with that aspect (geez…among so many other aspects I suppose!) of creating a mix of them. Thanks again. Hello Griff. Counting issue for me. In bar 9, and 10 at the count of 3 is my problem. Bar 9 I’m counting this as 1 + u, 2 + u, then when I’m at the third beat, I see two tied eighth notes. Not sure if the first eighth note gets a 1 + or just a 1. If they are truly eighth notes, it is hard to count in triplets then switch to eighth notes then back to triplets. I need some help with this . Nice work. Sat down last night to this and had Alot of fun. Just one more little piece of the puzzle to put I’m to use. Put this to use with the standard licks with box 1 and 2 in E and there is Alot of music to play with. Great riff Griff, I was hoping there would be tab so I could print it up for my son and daughter. Pick Long and Prosper! Can totally hear Duane Allman there, and agree, not very “bluesy” sounding. Cool lesson, thanks. …and such a cool little riff – though I’m still shredding my fingertips on the bends! That’s so Peter Green around the time of early Fleetwood Mac! You are my morning coffee…great job and I have some of your videos!!! Great lesson Griff. That was something I had always wondered about. I always felt a bit conflicted as I felt what you were teaching was not what I thought I was hearing in a lot of classic rock. Esp southern blues/rock. This really made things much more clear. You rock Griff. Thank you. If it seems too difficult, you may just not be there yet and that’s fine you will be someday and this will give you an idea of what is to come. However, I suggest watching the video all the way through two or three times before you try to play it. That also may help because you will catch little things every time you watch it through. Which box are you using? cool riffs…always good to have in the pockets…thanks…later. well, just starting out but some of your intro stuff is very quick…by the time you have looked at where the fingers are going and what fret you are onto the next piece…, maybe I’m just a little behind..